Travel back in time to the ancient Colosseum, and see gladiators fight, or fly up into space to the International Space Station. Radical VR is pleased to announce that we will be partnering with the Houston Museum of Natural Science (HMNS) in developing their new innovative exhibit focused on showcasing immersive & interactive technologies called “Reality Check”. “It was an easy decision for us to partner with Radical VR. We hope to continue this partnership and make Reality Check the starting point for virtual reality, augmented reality and mixed reality in a museum setting.” Latha Thomas, VP of Marketing & Communications, HMNS. Travel back in time to the ancient Colosseum, and see gladiators fight, or fly up into space to the International Space Station. Radical VR is a global provider of educational and interactive virtual reality (VR) and augmented reality (AR) solutions for the museum market. 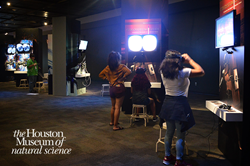 We are pleased to announce that we will be partnering with the Houston Museum of Natural Science (HMNS) in developing their new innovative exhibit focused on showcasing immersive digital & interactive technologies called “Reality Check”. Radical VR’s Colosseum Lives title & upcoming Edge of Space VR experience will be showcased as a core component of “Reality Check”. Utilizing the Oculus Rift headset, the beta edition of the Edge of Space VR experience allows players to explore the International Space Station from the perspective of a photojournalist. Ride the new Boeing spacecraft up to the Space Station, dock and explore. The production version of this title will have innovative interactive features like a selfie camera and digital mementos shareable through social media. For more information: Edge of Space VR. If you are in the neighbourhood, we would like to invite you to come and check out the new Reality Check experience at the Houston Museum of Natural Science (http://www.hmns.org/). Radical VR - based in Toronto and servicing the global market, Radical VR, provides virtual reality (VR) and augmented reality (AR) solutions for the museum market. Our team has over 30 years of combined experience and our goal is to help museums offer new attractions that are unique, immersive, educational and will drive new revenue streams. We have a catalog of commercialized VR experiences available to museums and we have plans to add two to three titles per year to our content portfolio. The Houston Museum of Natural Science—one of the nation’s most heavily attended museums—is a centerpiece of the Houston Museum District. With four floors of permanent exhibit halls, and the Wortham Giant Screen Theatre, Cockrell Butterfly Center, Burke Baker Planetarium, and George Observatory, and as host to world-class and ever-changing touring exhibitions, the Museum has something to delight every age group. With such diverse and extraordinary offerings, a trip to the Houston Museum of Natural Science, located at 5555 Hermann Park Drive in the heart of the Museum District, is always an adventure.